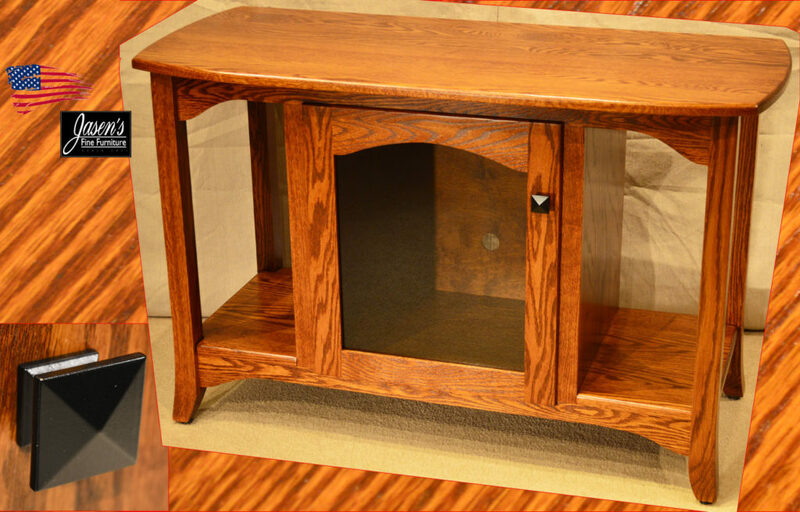 Amish Carlisle TV Stand features solid Rustic Cherry construction, smoked glass, inverted bowed top shape, and small bevel for top. Ebony rope accents are used under the top with unique matte black twist hardware. The left door features 3 hidden dvd drawers behind it as well. Matching tables are available, see our coffee and end tables. Available in your dimensions, many wood specie, finishes, and hardwares. 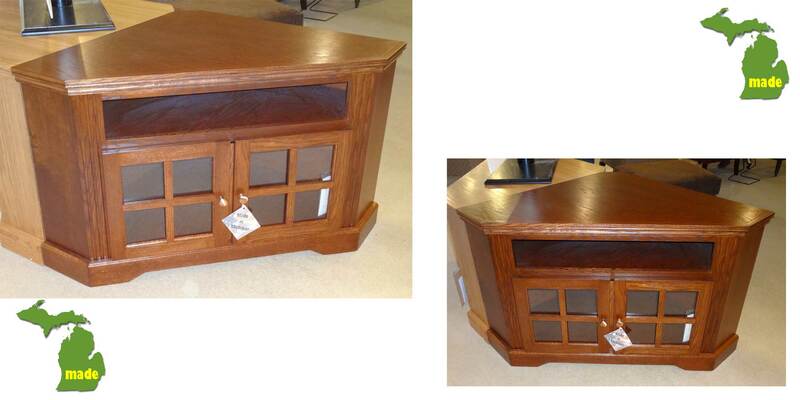 The ever popular Contempo TV console gets a face lift in addition to being functional. The TV stand features ample storage, yet modern, clean lines. Three drawers are featured in the center while the area can also feature a fireplace. Furthermore, all drawers feature durable yet smooth full extension glides. The stain used is a Driftwood color consequently adding to the "Contempo" concept. Hardware featured on the Contempo is rather rustic modern. The stain, wood specie, hardware, size and configuration are also customizable. Purchasing Michigan made products hence doubles the efficiency of the Michigan economy! 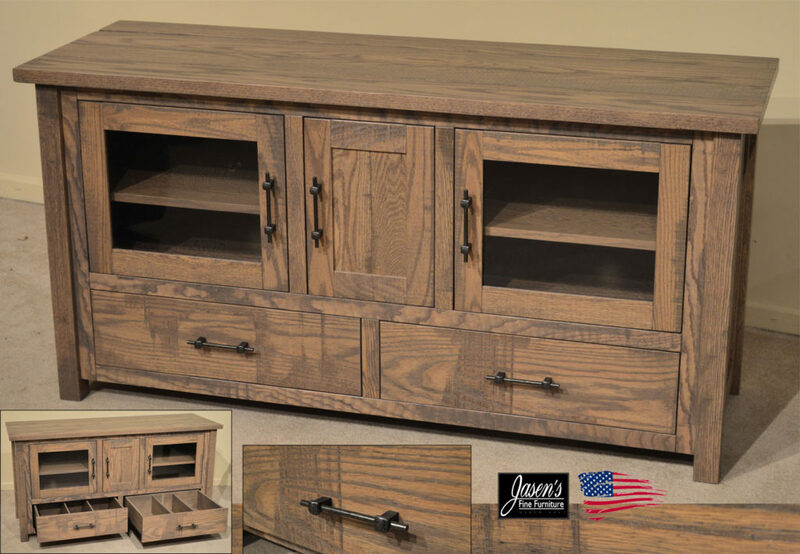 Size: 33"H * 72"W * D 18"
Oak TV stand features transitional style while featuring traditional Oak. The piece has an open feel instead of the standard closed in construction. The enclosed area while on it's own is able to hold a large amount of components. Behind the glass doors includes one adjustable shelf and a cord hole in the back. 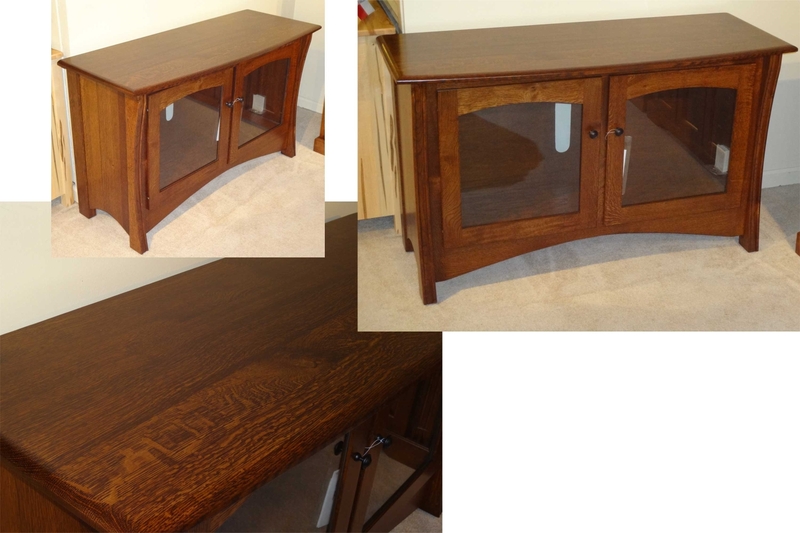 The TV stand can be ordered in a large nearly limitless variety of wood specie and stains. The TV Stand can also be ordered in any sizes in any directions. Made in the USA! 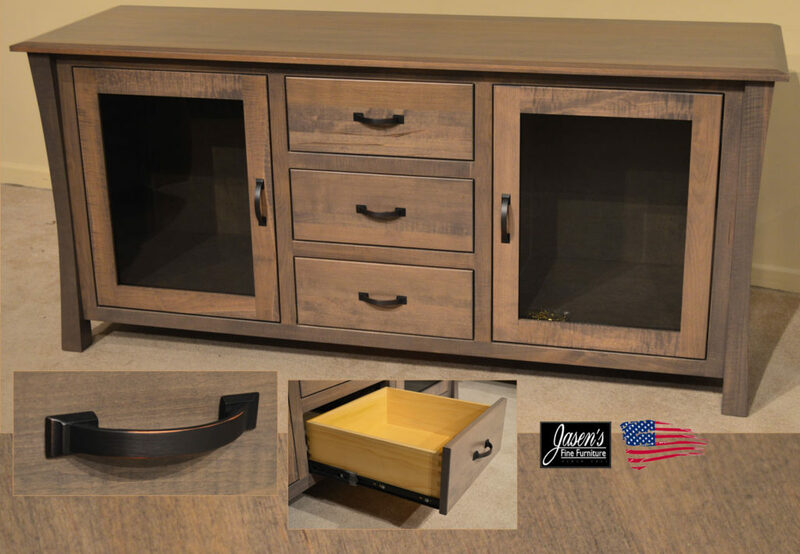 Size featured is 29.5"H 46"W 20"D.
The TV stand offers modern style, color, and and functionality for your new flat screen television. 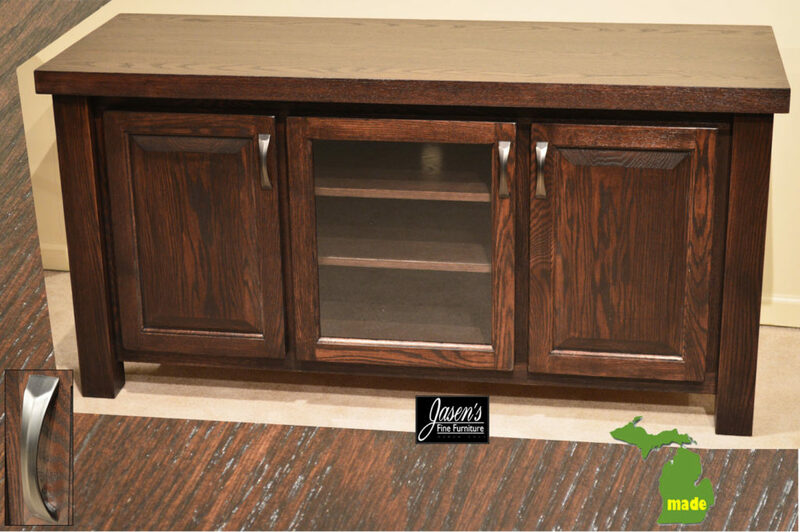 The Driftwood TV stand is constructed of completely solid brown maple. 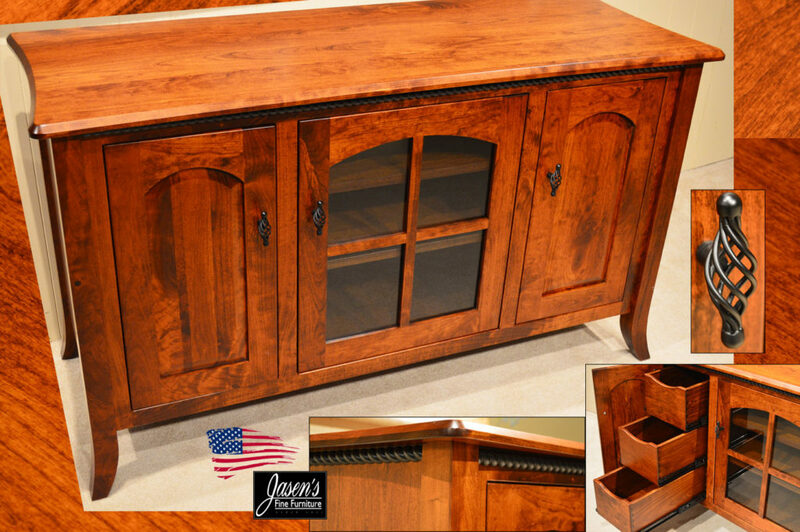 The TV stand is available in any wood specie of your choice including oak, maple, cherry, and quarter sawn white oak. Once you have selected your favorite wood you can pick from a large variety of stain colors! The hardware shown is a brushed gray with oil rubbed bronze on it's edges. There are 100's of different types of hardware available for the TV stand upon special order. The piece is also available in different sizes or it can be ordered in any dimensions. Made in the USA! The rough styling starts at the top of the TV stand with it's plank barn floor style, knot holes, and mill marks. 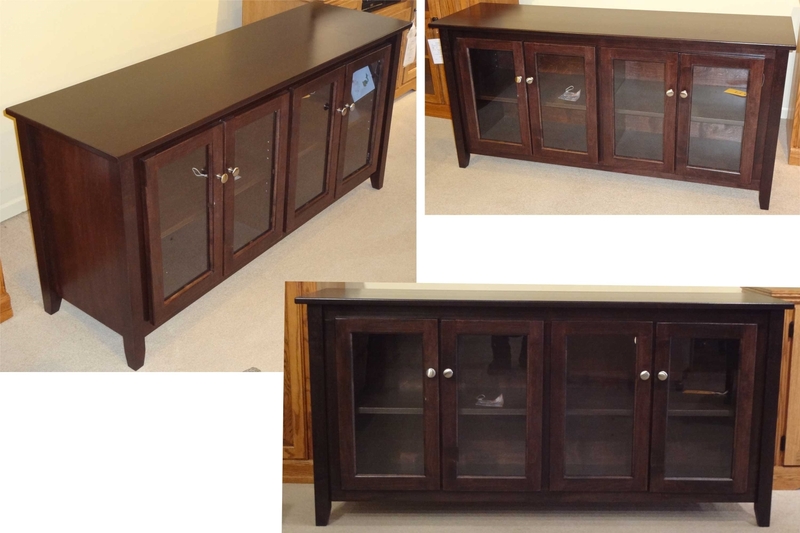 The TV stand is shown in 60"w, but is available in any size you specify. Can be ordered in any wood specie, color, and hardware of your choice. The wood species available on the TV stand include oak, maple, cherry, quarter sawn white oak, and rustic cherry or quarter sawn white oak. Hardware choices for the TV stand number in the hundreds for a nearly unlimited selection. 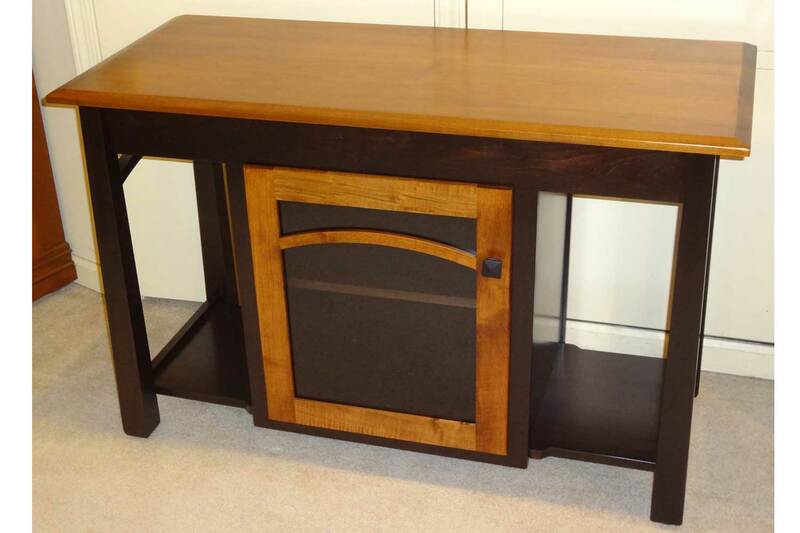 Amish Mission Tile TV Stand. 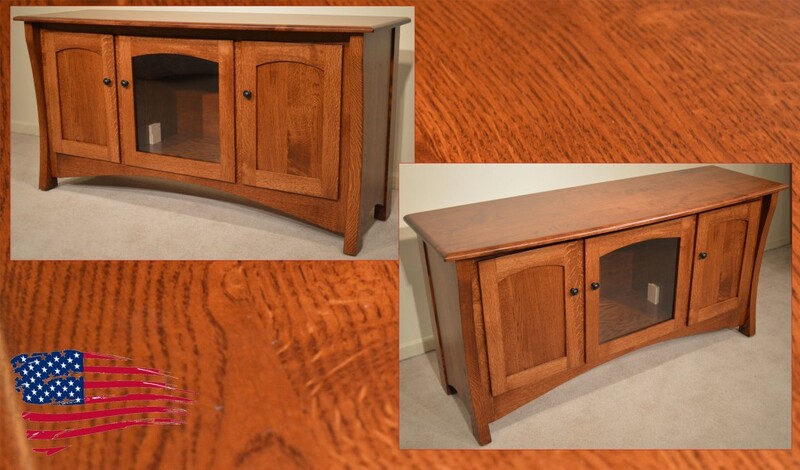 Tv stand is made of solid quarter sawn white oak with each piece of lumber carefully selected for maximum visual appeal. Console also features real ceramic tile top, full extension drawers, and antique style hammered copper hardware to compliment the earth tones of the tiles. The stand can be ordered with a wood top or in any wood specie, stains, and hardwares of your choice. Made in USA! 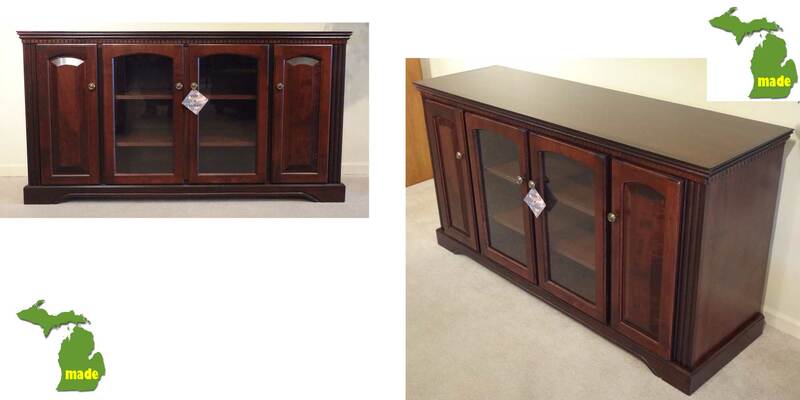 H- 29.5" W- 60" D- 20"
Features solid top, sleek styling, 2 adjustable shelves, and is fully enclosed with glass doors. Designed to hold 60" flat screens. Available in any wood, finish, and hardware of your choice. MADE IN MICHIGAN!! 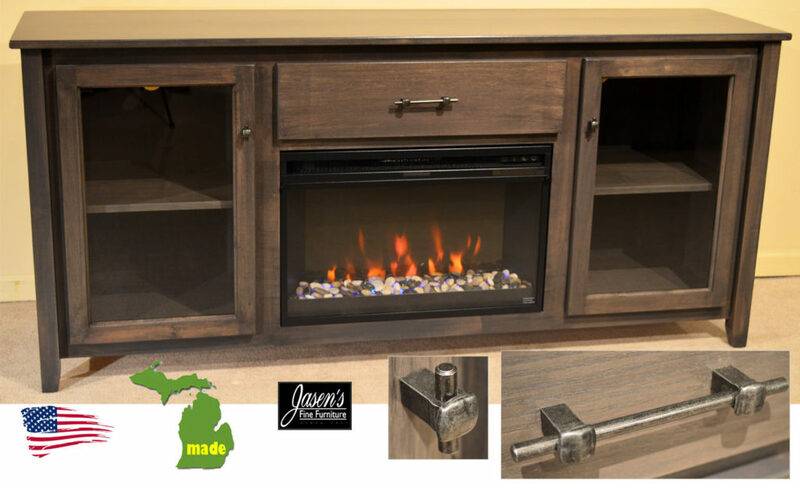 Corner of wall out: 45.5"
60"W x 30"H x 20"D.
H: 38.5" W: 60" D: 18"
Contempo style entertainment center designed to keep you warm on those chilly Michigan winter and fall nights. 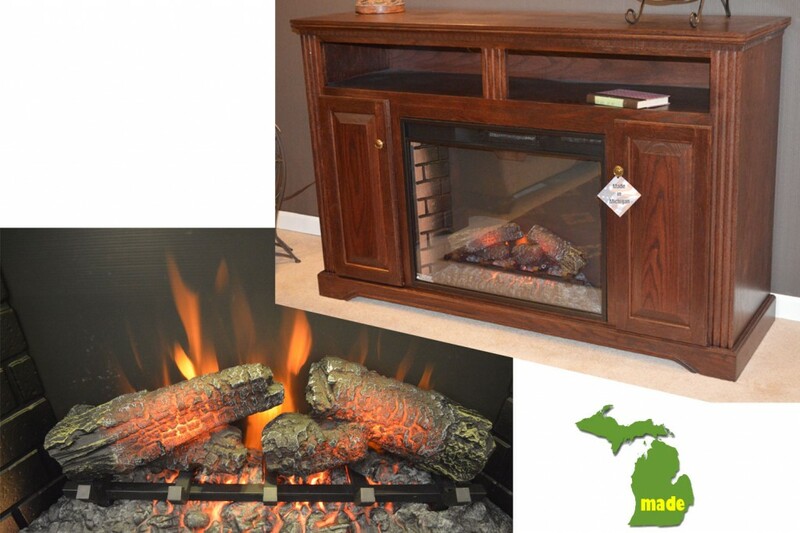 Fireplace insert features remote for heat, lights, timer, and turning the fire effects on and off. Glass bead fireplace is now shown, but traditional fireplace can be ordered. Glass Bead Fireplace insert features rotation of colors or can be set in various colors with out rotation. 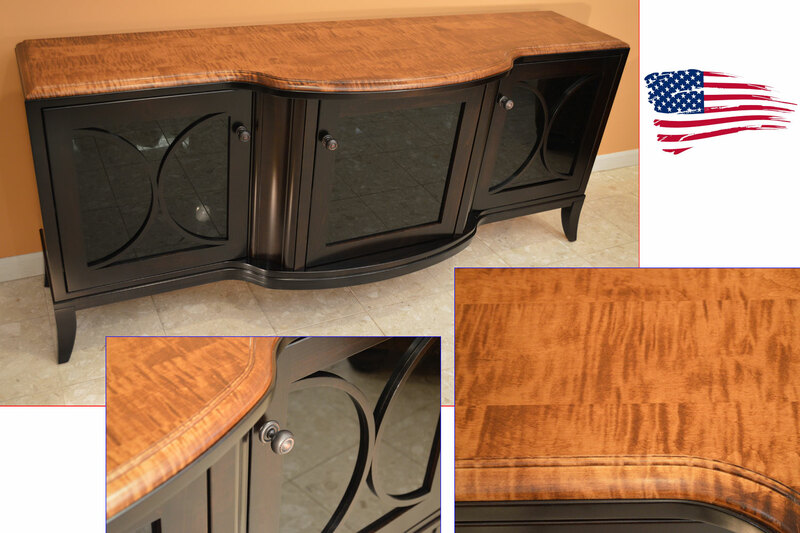 H: 33" W: 72" D: 18"
A timeless piece that features tiger maple top, traditional styling, smoked glass, curved mullions on doors, rubbed bronze knobs to accent the two tone, and cord holes are in between each section for ease of wiring. MADE IN USA. Customization is available on this piece. Order in any size, wood specie, finish, hardware, and much more! 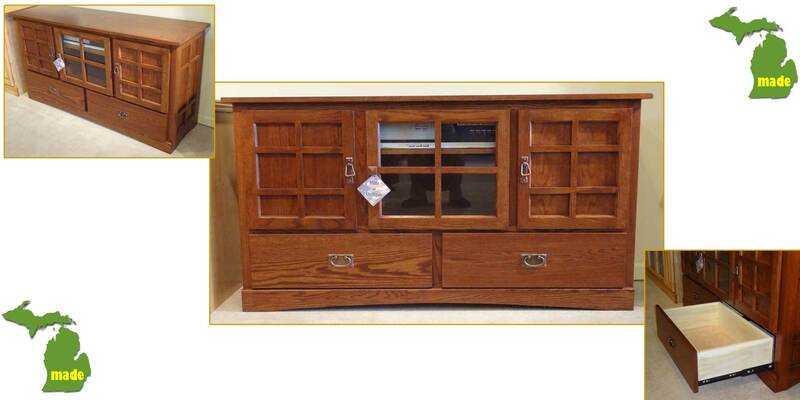 60' TV Console; Antique Brass Knobs, RTM66 MAPLE, post legs, all moldings are returned to the back, arched doors, dental moldings, and concealed hinges. 60'W x 32'H x 18'D. Nickel Knobs, Almost Black MAPLE, post legs, Solid top, and concealed hinges. 60"W x 28"H x 18"D.
Contemporary styling. Can be ordered in Oak, Maple, or Cherry with 30+ finishes and 16 hardware choices, and your custom sizing. MADE IN MICHIGAN. 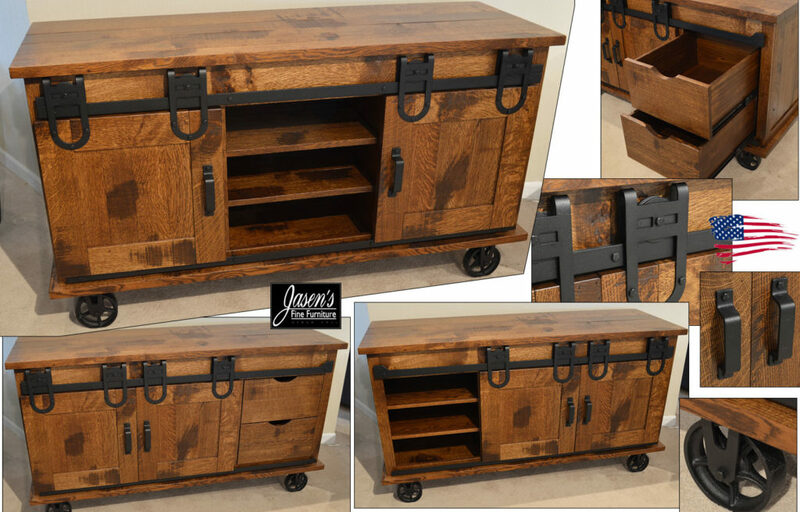 Solid Rustic Quarter Sawn Oak, Smooth black knobs, 2 doors with 2 adjustable shelves. 50"W x 30"H x 20"D.
Can be ordered in Oak, Maple, Cherry, and quarter sawn oak, with 30+ finishes and a full hardware catalog, custom sizing available. MADE IN USA. 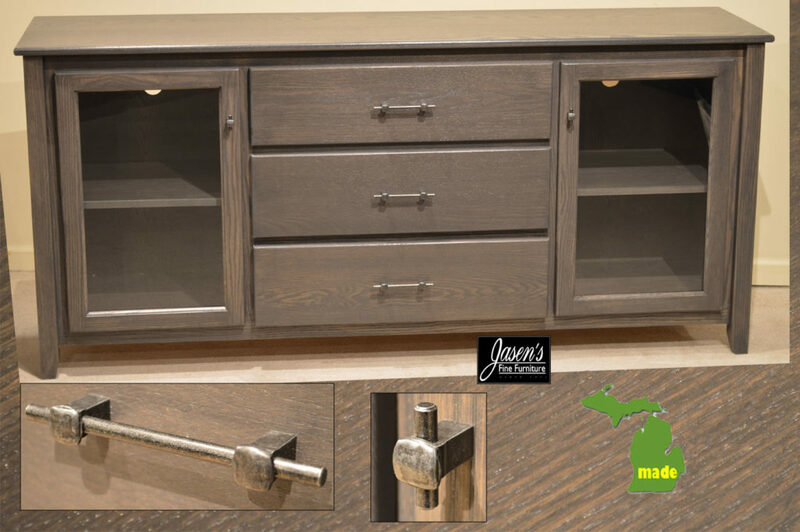 Beveled Black Knobs- Solid Brown Maple with Rich Cherry finish, curved top and legs, arched glass doors, and 2 adjustable shelves. 63"W x 30"H x 20"D (45.5" at the wall). 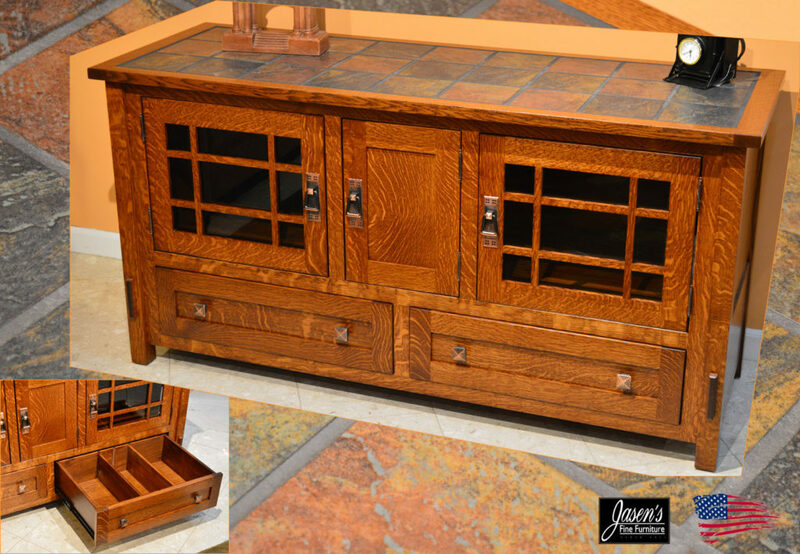 Copper Mission Hardware-3 kinds of handles, Mission Cherry OAK, concealed hinges, solid top, raised panels on sides, and 2 Extension glide dvd/media drawers on bottom. Extension drawers fit your dvd library. Can be ordered in Oak, Maple, or Cherry with 30+ finishes and 16 hardware choices, and your custom sizing. MADE IN MICHIGAN. 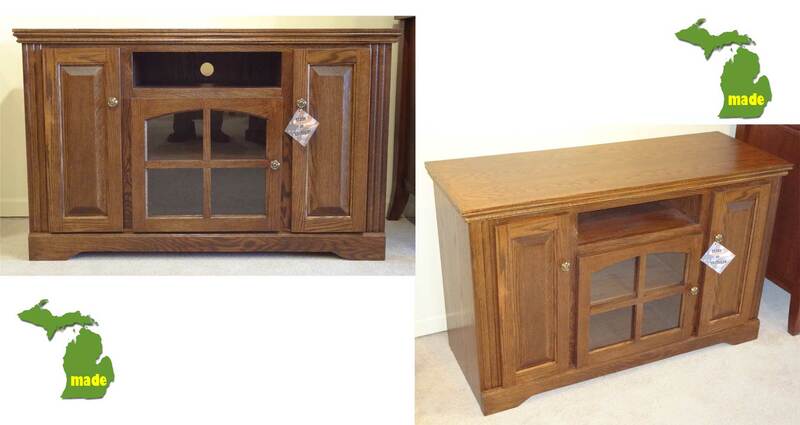 47" TV Console; 47"W x 29.25"H x 18"D.
Antique Brass hardware. Solid Oak and plywood, 3 adjustable shelves (one in each compartment). Behind Inner Left and Right doors 12w * 25h * 16"d; Top Center 18w * 4.5"h * 16"d; Bottom Center 19w * 17"h * 16"d.
Can be ordered in Oak, Maple, or Cherry with 30+ finishes and 16 hardware choices, and your custom sizing. MADE IN MICHIGAN. 46.25"W x 27"H x 25"D and ATW (at the wall) is 33.5".